The Economics 101 textbook tells us that ‘if prices fall, demand should rise… all other things being equal’. It is an unfortunate reality of the real world that all other things are rarely equal. This leaves us with the practical challenge of trying to understand how LNG demand may respond to lower prices. Price-induced LNG demand growth is one of several market clearing mechanisms that can help absorb the imminent global LNG supply glut. LNG demand response in Asia is particularly important given high levels of LNG import growth and relatively low levels of existing contract cover. So does evidence to date support the economic theory? And how could Asian demand response evolve across the remainder of this decade? We take a look in today’s article. We start with the empirical evidence to hand. Asian LNG spot prices fell by almost 50% from 2014 to 2015. Table 1 shows volumes of LNG consumed (and % change) across the two years. Total Asian demand fell in 2015 (year-on-year) rather than rose, confounding economic theory (in the LNG market context). This was driven by declining demand from the three biggest Asian buyers, Japan, Korea and China. China, Asia’s biggest growth market, recorded its first ever decline in LNG demand in 2015. As always, it is important to consider a wider set of drivers in play. 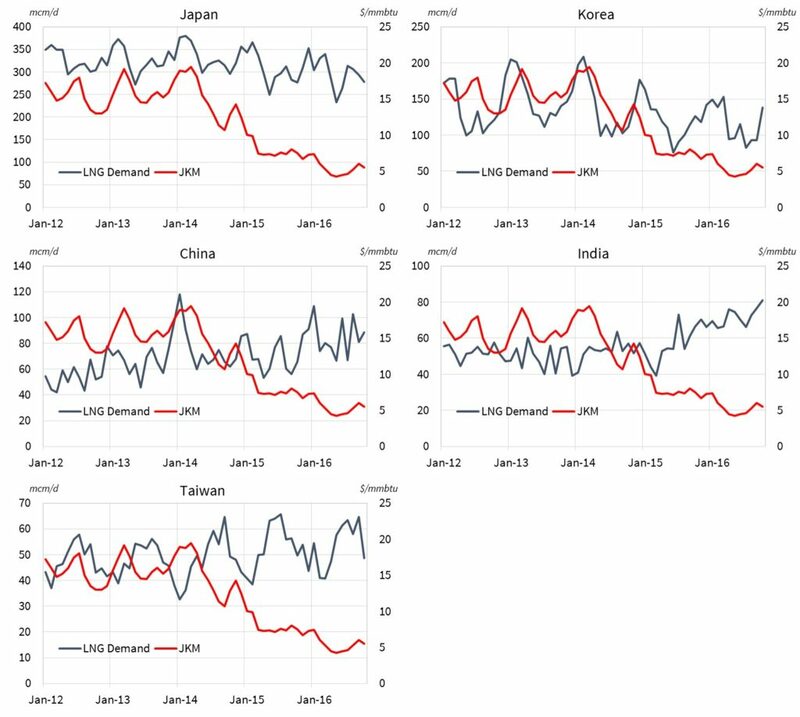 Falling LNG demand in these larger markets was a function of substitution to cheaper coal fired generation (coal prices also fell sharply), combined with warmer winter weather and weaker economic activity. In other words all other things were ‘not equal’. Looking beyond the three largest importers the evidence was somewhat different. The ‘top 5’ Asian buyers are rounded off by India and Taiwan, both showing single digit percentage increases in demand. It is challenging to define how much of this volume rise relates to ‘business as usual’ demand growth versus demand response induced by lower prices. Some of the smaller Asian markets saw significantly higher percentage rise in imports (e.g. Thailand, Singapore and Malaysia), although for several countries these rises come off a very low base e.g. Indonesia only began importing LNG in mid-2014. But in absolute volume terms, the increases from these smaller importers is relatively limited. Asian LNG demand is predominantly driven by the top 5 buyers. Chart 1 shows the recent evolution of LNG demand across these top 5 markets. Is the picture changing in 2016? It is dangerous to read too much into one year of empirical evidence. Demand data for 2016 is still coming in and does not yet capture the important Q4 winter consumption period. 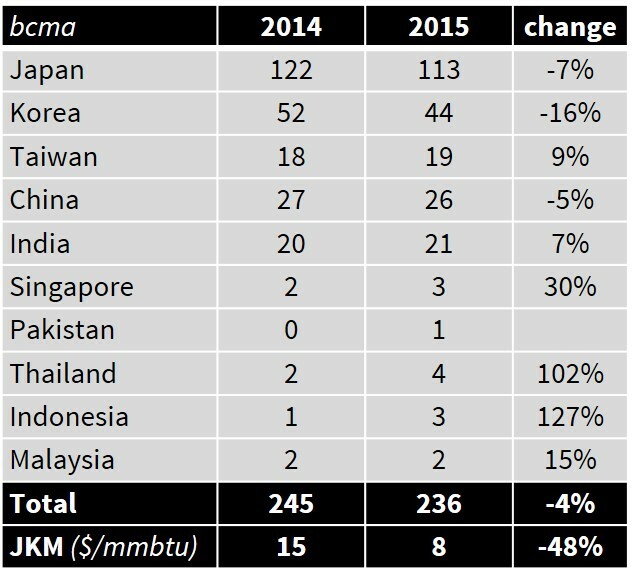 But so far LNG imports for the two big Asian buyers, Japan and Korea, are weaker over the first three quarters of 2016 (vs 2015 levels). China on the other hand looks to have returned to import growth mode. Imports over the first three quarters of 2016 are up by more than 19% (vs 2015). But this in part reflects increases in LNG purchases as a result of an over-contracted LNG position. China has not been a particularly active buyer of spot LNG cargoes so far in 2016. The release early next year of full year LNG demand data for 2016 will provide an interesting point of comparison. But in the meantime, let’s consider some of the factors likely to drive the evolution of Asian demand response. In the absence of an economic shock, it is reasonable to expect ‘business as usual’ demand growth to continue across emerging Asian LNG markets into next decade. This is supported by powerful tailwinds from expansion in energy consumption with economic growth and an increasing policy focus on emissions favouring gas over coal as a fuel. Limited market mechanisms: Clear and liquid price signals are an important catalyst for price induced demand response. In Europe, liquid gas and power markets support power sector switching of gas for coal as relative prices fall. But Asian energy markets are heavily regulated and lack clean market mechanisms to induce fuel substitution. Substitution may take place anyway (e.g. there is evidence of this in 2015), but it is likely to be in lower volumes at a slower pace. Policy vs market drivers: Because gas markets are more highly regulated, procurement policy plays an important role in driving changes in demand behaviour. Changes in the procurement policy of state buyers (e.g. China) or large utilities with long term contract cover (e.g. Japan, Korea) is typically slower and more cumbersome than direct market response to price signals. Infrastructure constraints: A number of secondary buyers (e.g. Taiwan, Pakistan, Singapore) do not currently have the regas capacity headroom to ramp up demand significantly above current levels. There are also energy infrastructure constraints within a number of markets that limit the substitution of gas for other fuels e.g. limited gas-fired capacity in the power sector. As is often the case with commodity demand, China looks to be key. In Nov 2014 CNPC laid out 115 bcma of gas to coal switching potential across the remainder of this decade (covering the power, industrial and heating sectors). But it is unclear to what extent this will (i) be met by LNG versus other sources of supply and (ii) be volume responsive to lower LNG prices. Before the plunge in prices, China viewed LNG mainly as a source of flexible top up supply (e.g. for gas storage and peak shaving). But that was based on the premise that LNG was uncompetitive versus alternative pipeline and domestic supply. Global LNG oversupply is reshaping that competitive balance, at least for the moment. The extent of China’s policy reaction to lower LNG prices will likely be the key factor determining the potential for incremental Asian demand response. Timera Energy has published a client briefing pack ‘Global Gas Market – the path to market recovery‘. This includes an overview of current global pricing dynamics, how the LNG glut will be absorbed and the market evolution into next decade. You can download the briefing pack by clicking on the title link above or going to Latest Insights. Timera Energy offers tailored in-house workshops exploring the evolution of the global LNG and European gas market fundamentals, pricing dynamics and the implications for asset values and commercial strategies. These involve Timera Senior Advisor Howard Rogers (also Chairman of the Gas Programme at the Oxford Institute for Energy Studies), who is acknowledged as a leading industry expert in the global gas market.